I just stepped off 55 hours of flights and airports leaving behind Chiang Mai, Thailand for Mexico City, Mexico. MC will be my home for the next 2 1/2 months, but as I coasted over the freezing waters of the north Pacific I found myself reminiscing. Did I accomplish what I wanted to in Thailand? Here is a list of the goals I had when I went to Thailand, and how I did with each one. Learn Thai massage. My teacher suggested I do this, as a way of taking home something unique from the culture. I only wanted to learn a basic set of movements—enough to give a 30 or 60 minute basic treatment. I went to a lot of massage schools in Chiang Mai and paid for a massage, and frequently found them lacking. Many places just do a perfunctory job to make money from tourists. Eventually in the village of Pai I found one old woman who was a true master. She treated her art as a spiritual path—she was the only one who began with a silent prayer to Buddha—and she dug into my pressure points with energy and precision. When I asked if she taught, she took me to her teacher’s school, but sadly he was not available till after I left. Eventually I went with NAMO Massage School in Chiang Mai. They taught me a professional half-day class. The instructor spoke fluent English, was very attentive and indeed included the wai to the shrine (“Pray to your teacher, or the Buddha, or God” she said). I left knowing about 10 movements and feeling competent in them. Explore the Thai countryside. I wasn’t too sure about this because I didn’t know much about the lay of the land, but it was highly doable. 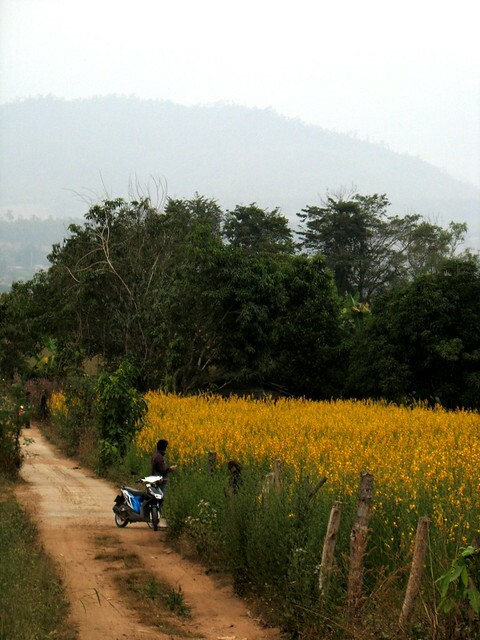 I rented a motorbike and, after some hair-raising driving lessons from a Dutch friend, made the four hour road trip to the village of Pai, the highlight of my trip. Late in my stay, I also met some American friends—a white boy professor from Wisconsin and his Hmong-American wife—who annually travel rural Thailand, Laos and Burma to do social advocacy. They painted such a beautiful (and safe!) picture of northeastern Thailand that I really wanted to add a trip to the city of Chiang Rai and the highway along the Burmese border. Sadly I was out of time. Probably my biggest regret of the trip. Learn Eastern geomancy. This is going well, and until I’m ready to unveil some stuff, that’s all I’ll say about that. Learn to live alone in a foreign country. I’ve been abroad before but always with people I knew and never for more than a few weeks. A month alone? Don’t even speak the language? How did it go? This was a stunning success. By stunning I mean I surprised myself with my ability to cope. Not that there’s a whole lot that needs coping in Thailand, but I weathered a serious fever, a case of food poisoning, and a lot of loneliness. I’m proud that I went up to strangers and made friends, networked with other traveling bloggers, and made myself acculturate to Thai daily life (showers, toilets, not walking on trap doors… you get the idea). All in all I’ll call the Thailand trip a success. It showed me some highs and lows of the traveling lifestyle I’m embarking on, and hopefully it’s prepared me to better deal with everything that comes. Great review of your time in Thailand, Drew. Thanks for sharing this. It made me reflect upon my trip to Bangkok, and Koh Samui in 2003. Enjoy Mexico City. Cheers to you. Thanks Ann. I’d love it if you can tell me about your time in BKK and Koh Samui – especially Koh Samui. Highs? Lows? I didn’t experience the southern half of the country/the islands at all. Congrats! I am just recovering from jetlag myself and now weathering the cold the baby is suffering through (someone has to get sick from a transcontinental flight!) all in a town I’m committed to living in but haven’t ever been to before! I am with you in spirit. I look forward to hearing more about the geomancy – as well as everything new adventure in Mexico! Your blog/journey/attitude continue to inspire me. Whoa!! That sounds like you have some stories to tell! Can you share? What’s going on? Just arrived somewhere you’re determined to love that you’ve never been to before? You gotta say more about that! After reading your review of your stay in Thailand, I now understand more how it fits in with your plans for the Great Adventure. Thanks Val. Yeah, in a way it could’ve been Turkey or South Africa or France or anywhere… Thailand was the one that called to me, but the trip happened mainly to get me prepped for living alone on the road. I thought it was a fun, if daunting way to do it! I’m looking forward to reading your goals/plans for Mexico. Your next stay inspires me to brush up on my Spanish again. My friend, I’m glad the trip was a success. We’re about to embark on our own Southern India adventure, never having been to that part of the country before. I’ll let you know how it goes — but there will be R&R. Bravo! It sounds like it was a great experience and a great start to The Adventure! I am loving the site, you write in a very calming way! sounds like the beginning of a great trip and a great lifestyle. I’m currently doing a bit of the same, living in India atm, and your section on relaxation grabbed my mind. it really is next to impossible to relax properly in places that are so dirty and loud but still this is a bit contradictory to most peoples notions on traveling. Jona, first off, I LOVE your hair! Second, thank you for the kind words and I am so happy you’re reading :) Welcome to Rogue Priest. I know exactly what you mean. Personally I would say your theory is spot-on. In MC I sleep on a twin-sized bed. When I go to sleep my roommate is still playing loud music in the next room, often death metal. Nonetheless, in my clean room in our safe neighborhood, I fall deep into a cozy sleep in a moment’s time. I also feel much calmer even in stressful situations – at the airport, running for a flight, being stopped by security, or at a crowded market. Travel is a great boost for meditation. I’d love to hear more about your India stories. Are you blogging them anywhere? Or would you like to do a guest post here at Rogue Priest? Haha that’s quickly become the standout frase of my internet existence. Me and my hair thank you! And thanks for the warm welcome. So happy to hear you agree, I’m going from India to the US for a two month road-trip so I’m clinging to the hope that the time here will result in and extra sense of relaxation. I aim to relax to the point of melted cheese. Please keep me posted on how the ‘meditation while traveling’ goes for you. And i will most certainly keep reading. And you won’t have to ask me twice to do a guest post, I would be truly honored. There is a blog, http://girlyjona.com/ but it’s not very travel-centered, and I’ve had some travel-topics percolating in my head for a while now. I overflow with stories! Did the bobcat help at all in dealing with the loneliness? I’m glad you achieved the things you did. I look forward to reading about your experiences with Eastern geomancy. For some reason this puts me in mind of my PerePere, maybe because he often worked with dowsing rods and had ways with some things. I don’t know much about it as very little knowledge was handed down unfortunately. Wrote down what I could. Which reminds me of your thoughts of putting to writing what you know of the Old Belief. Would that be something you’d consider more of an after adventure thing, or a potential part of your journey? Maybe even writing your own spin on the Old Belief consolidating what you’ve learned from other places. The bobcat has been great! I do want to continue to pass on the Old Belief. I have never written a book about it because traditionally draíocht is not put in writing. Many people today belittle that old stricture but when you acculturate to the Old Belief you can see it has a lot of value. I have always allowed my students to take written notes but have always insisted on direct person-to-person transmission of the teachings. There are specific topics I’d like to write about, such as meditation, that I feel would be okay, but to put our overall teachings on the Old Belief in writing would be a momentous decision. I have considered starting a Youtube channel and doing videos, or offering apprenticeship via Skype. What do you think? I do like the you tube and skype idea to do it traditionally. I personally am all for putting it all to writing because that was one of the biggest problems about preserving this knowledge. And that is how you can treat the written material – as a way to preserve the knowledge. Just ask any librarian. And just because it is written, doesn’t mean that it must be taught through writing. Like you said – You can still teach traditionally via youtube and skype.